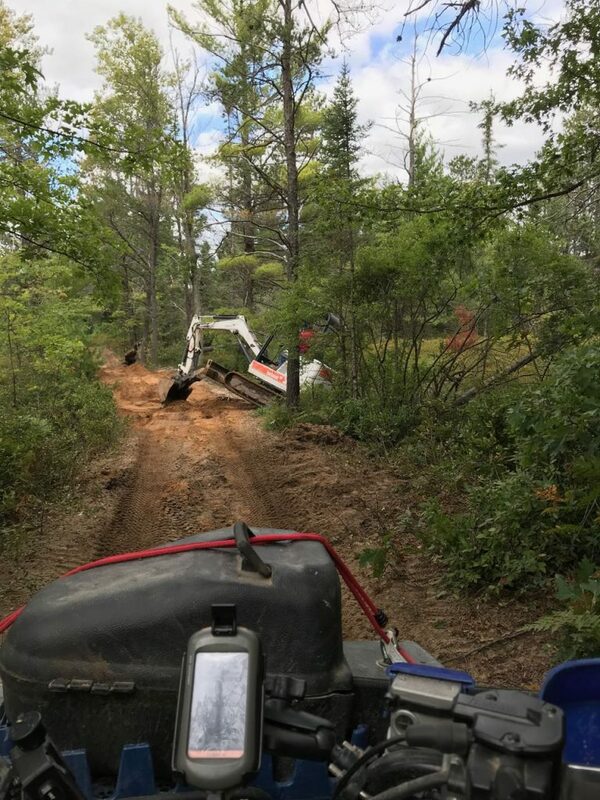 GLDS maintains the Geels ORV Trail as part of a grant from the MI DNR. We brush and sign the trail; also we grade the trail as an additional part of the grant. 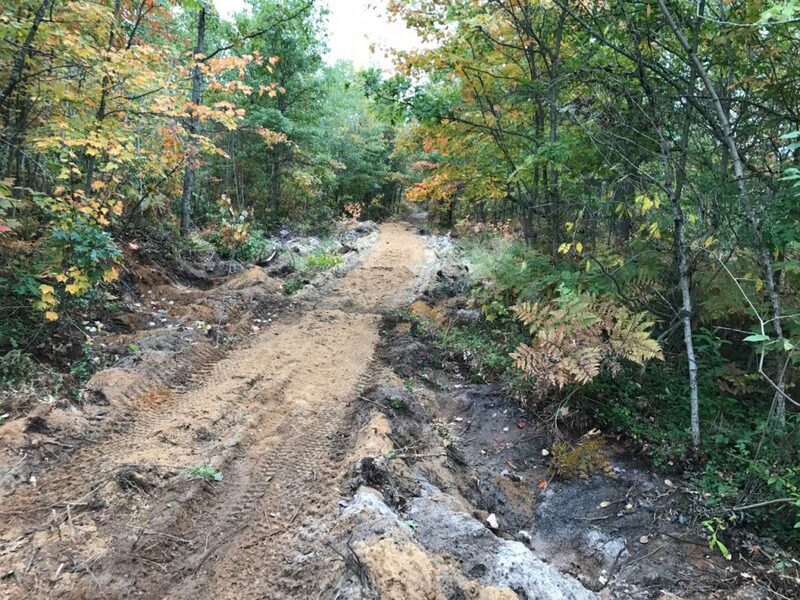 In 2018 we added a “special maintenance” project as part of our grant to fix and restore the trail bed in certain areas of the trail. Effectively, there were “mud holes” in spots along the trail that had developed from a low spot that would collect water. 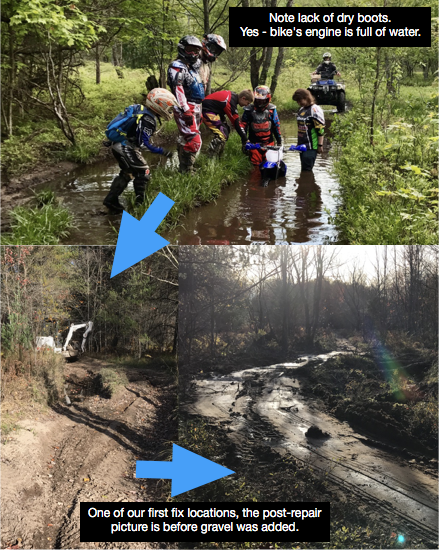 Riders would slosh through and splash mud out or carry it down the trail with them, which would then make that spot even deeper and hold more water. All of these spots were dry for 2/3 of the season, no running water. If the trail bed was even with the surrounding grade or slightly higher than the original grade, those muddy spots would be eliminated. Our project included filling in those sections and reshaping the trail bed to give water someplace to properly drain to, instead of pooling on the trail. Once the trail bed was restored to its original or correct height, we put down a light layer of aggregate (ie gravel/stone) to help stabilize the trail and ensure longevity. All material was native, either from the site directly or nearby. We were not trying to make gravel roads, instead trying to keep the trail as much of a “trail” as we could. 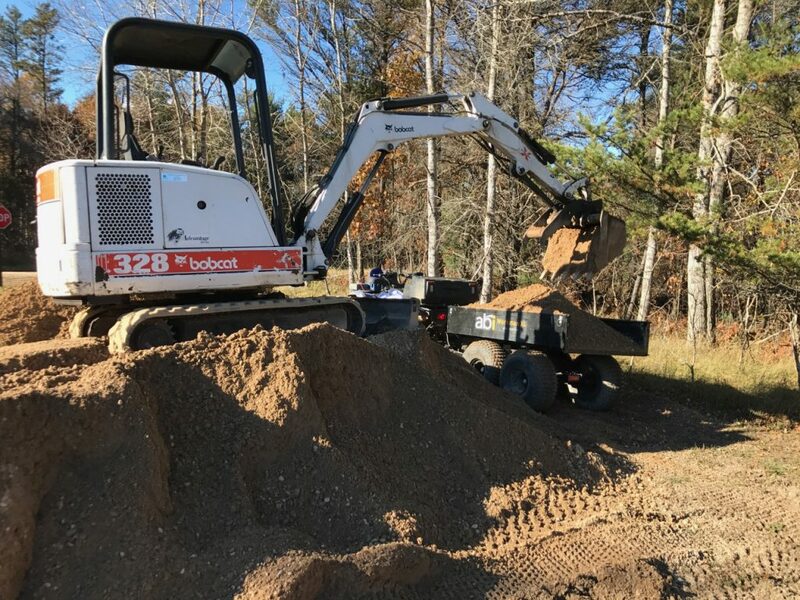 The Club invested in equipment, such as the Bobcat mini-excavator and powered dump trailers to make this happen. Many Club Members helped with the project and well over a hundred hours were spent on the various areas. 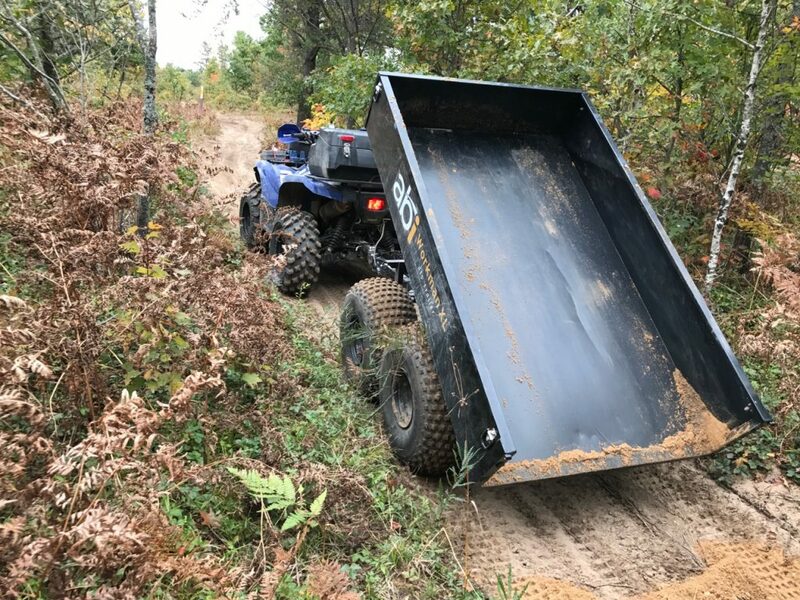 Some areas we were able to use material at the location, others required us to haul in using our ATV and dump trailer. The Bobcat did all of the material moving and preliminary finish work. 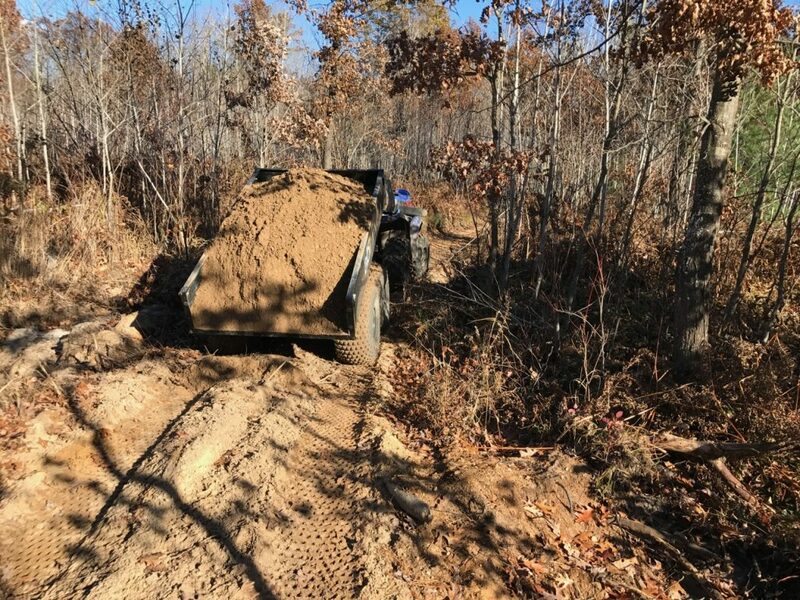 It “just” fits on the 50″ trail but at 3 ton still has plenty of size to get work done. 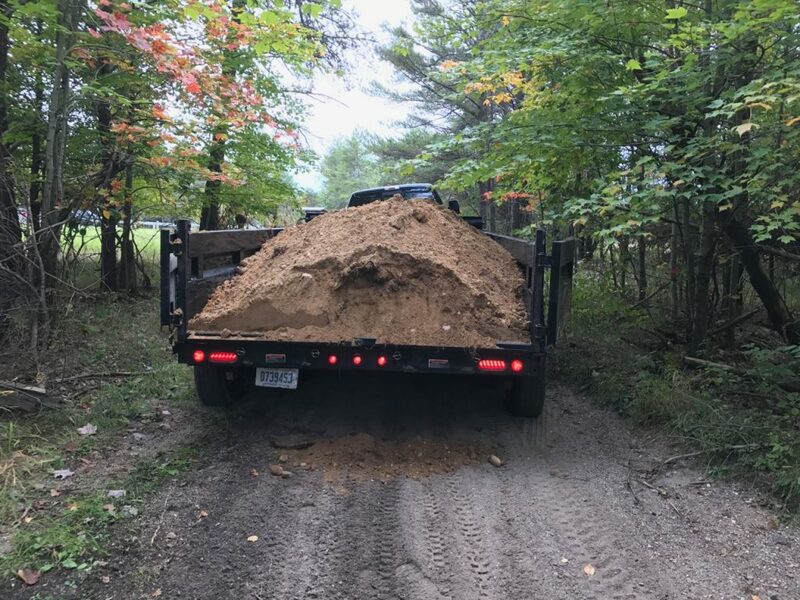 Gravel/stone was hauled in to all of the locations using the same ATV and dump trailer. Our ATV and grader were used to put a finish on the stone work. In total for this major phase, more than 35 spots on the trail were restored/improved which covered more than 3 miles of trail. We hope to make this a “dry boot” in-the-spring trail and this work has gotten very close to that goal. Given this trail has been in use for 40 years, we hope the restoration, improvements and continued maintenance sustain it for another 40.